Mark Edgar is hoping for a big end to the season. 'Photo by TONY HENDRON/Presseye.com. Confidence is high at Coleraine and rightly so with nine wins and one draw in their last ten games. Since Christmas the Bannsiders have been the form team in the Premiership, but defender Mark Edgar wants to have something to show for it. The former Blackburn Rovers full back was part of the Coleraine squad who demolished Ballymena United last Saturday to reach their first Irish Cup semi final since 2010. And Edgar wants to finish the season on a high with a trophy and European football high on the wish list. Glentoran are the latest club looking to end the Bannsiders impressive run of form, but Edgar is confident they can keep it going. “Hopefully we can secure another victory to sustain our challenge for third place and have a good chance of qualifying for Europe,” he said. “Glentoran have been in patchy form, but it will be tough as they have quality throughout their team. “We have to aim for another performance like last Saturday’s win, it was a terrific team performance and fully deserved. “Everyone knows that Jamie McGonigle and Eoin Bradley have a real eye for goal, and they took their goals well. “There are no easy draws in cup semi-finals, but Oran will have the team prepared for the challenge against Glenavon. Edgar was one of six players aged 21 or younger who starred for Oran Kearney’s men at Warden Street last Saturday. The left back said the faith the boss showed in the young players is now being repaid, but he also highlighted the importance of the club’s experienced performers. “Oran has a lot of courage and belief in the abilities of young players at the club,” he said. 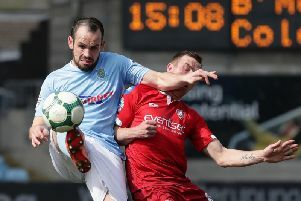 Kearney is hoping his side can harness the feelgood factor around The Showgrounds as they head back to league action this Saturday. “Hopefully now we can keep this going and harness the excitement over the next few weeks and get everyone in behind us,” he said. “This is the business end of the season, and the important stage of the season to be peaking at. The mood is slightly different at The Oval with boss Gary Haveron looking to make the most out of a largely disappointing season. “We are still in the mix for European football, even if it is an outside chance, so the target is finish as high as possible then look at a fresh impetus from the summer,” he said.